The economical advantages, strength, and durability of single-wythe and split-faced CMU construction make it popular for commercial and industrial building. Managing moisture in single-wythe walls relies heavily on waterproofing systems that are susceptible to cracking and damage from ultraviolet rays and normal expansion / contraction of building materials. Moisture that enters from imperfections in the waterproofing has few chances to exit the walls safely, resulting in accelerated wear on the masonry and moisture damage to interior components. 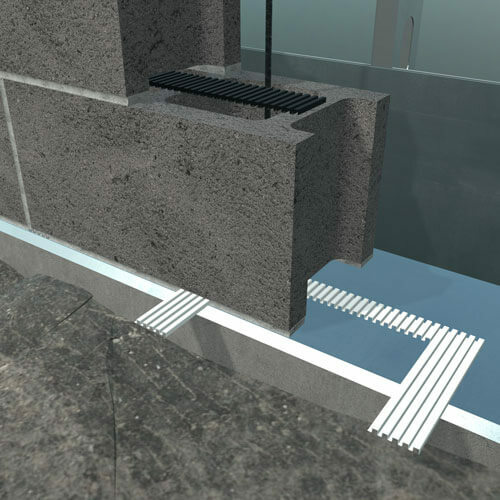 Drainage can be used in combination with waterproofing efforts to reduce the risk of moisture damage in single-wythe walls. Modern methods can improve labor efficiency and reduce materials needed for through wall flashings. 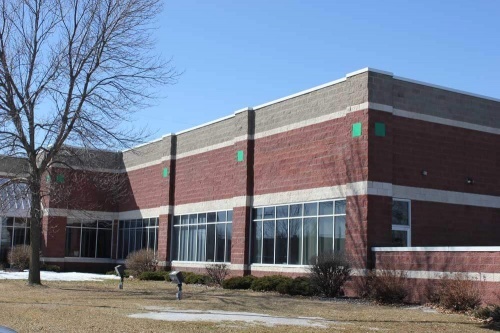 CMU block cores are a natural area for moisture to accumulate, whether from liquid water infiltration or vapor condensation. On bond beams and brick ledges the surface should be struck off with a ¼” per foot slope to drain to the exterior, and weeps tunnels directly on the flashing allow moisture inside the cores to drain. Masonry’s strong wicking potential can pull moisture across the CMU webbing and to the interior side of the single-wythe wall, where it can affect moisture sensitive finish materials. The interior side of a CMU wall also presents a potential for condensation. 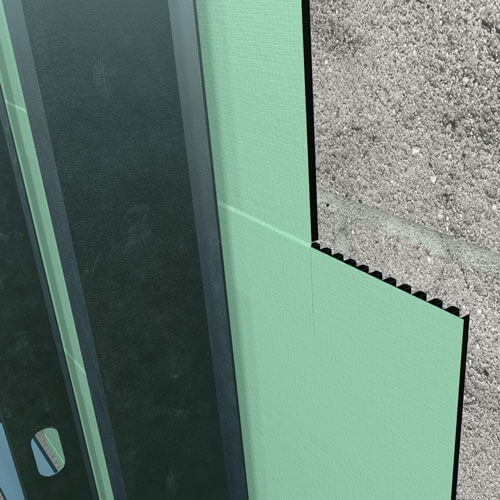 To maintain a separation between the finish materials and the masonry wall, include a drainage mat with an integral water resistive barrier over the masonry wall. At the bottom of the wall let the drainage mat drain below the slab or to the exterior. At windows and doors, divert the moisture away from the opening. That water that drains down the block cores to the flashing needs an exit strategy. Rope weeps and tubes don't work, and water doesn't run uphill to drain from cell vents. The flashing is the lowest point in the cavity - so create a pathway to drain water directly off the flashing. 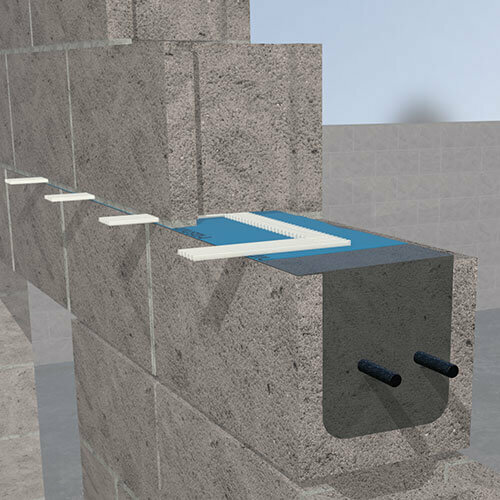 MTI's Cavity Weep™ is a self-spaced weep system that quickly rolls out on the flashing to create drainage tunnels for rapid drainage at the lowest point in the wall. Typical through-wall flashing is time, materials and labor intensive, and often results in a detail that doesn't drain efficiently. Instead, create a slope-to-drain to the exterior on the bond beam grout with MTI's Strikeoff Tool, flash the grout, and drain the cores with Cavity Weep™. This approach uses fewer resources, creates a stronger wall, and drains better. Capillary rise is a fact of life in masonry. Water can move vertically and laterally through the small pores in concrete, despite our best attempts at waterproofing. 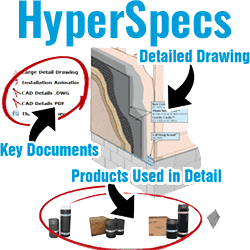 Separating moisture sensitive interior building materials from wet single wythe walls with Perforated Control Cavity improves building sustainability.